Our previous blog post in this series explored how a tumultuous time in Chinese history, the warring states period; lead to the formation of the Qin dynasty (秦朝 Qín Cháo). Today we will discuss how this dynasty, despite its short run, had long-lasting impacts on China and its culture. The Qin dynasty (221 BCE – 206 BCE) followed the longest dynasty in Chinese history, but ironically, was the shortest; lasting for only fifteen years. The chaos of the warring states period allowed Emporer Qin Shi Huang to unify all of the warring states for the first time in Chinese history and enabled systematical reforms to be implemented throughout this new large territory. Among the many reforms enforced, the new political structure took back land from the previous landlords and major projects were embarked upon; such as the beginning of construction of the Great Wall of China. Despite the developments in infrastructure and social structures, historians often consider the Qin dynasty to be a period of time where citizens were living under a tyranny backed by a powerful military. 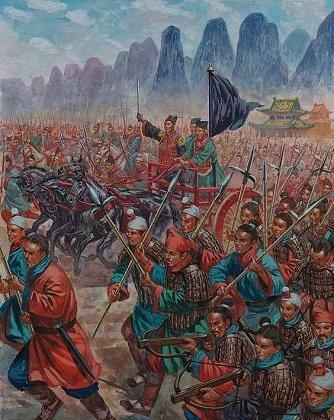 An artists depiction of the military might of the Qin dynasty. As part of the unification of the middle kingdom, currency and measurements were standardized. But most importantly, the written record was forever changed with the formation of small seal script (小篆, xiǎozhuàn). Small seal script was characterised by being more square; notably less rectangular than the writing styles that came before it. Standardisation was important because during the previous dynasties, various written styles had been developing independently of one another; known today as the Scripts of the Six States. Comparison of the character for death (死), illustrates how small script (the third character) was the first script to be standardised in stroke form and order. 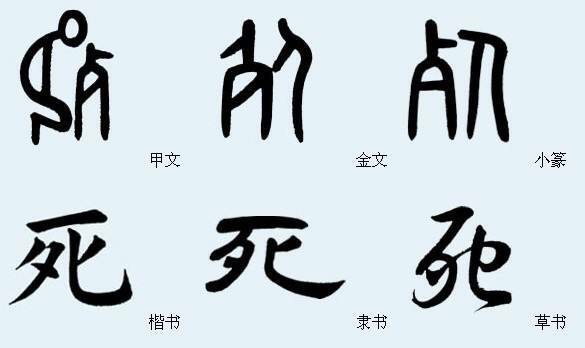 Comparison of the character for stone/rock (石); small script is the second character. Comparison of the character for real/true (实); small script is the second character. Small seal script was created by the prime minister Li Si. Although Qin Shi Huang was the Emperor, Li Si still had tremendous power and could enforce his desired reforms. Li Si created the 'Three Chapters' (also known as Cangjiepian); which was a collection of 3300 characters indicating their proper form and structure. This collection, a standardised instruction manual for writing in the small seal script, had the goal of decreasing the diversity of characters that had existed from text to text, and thus improving the efficiency of trade and communication. We know about 'Three Chapters' from written records from that period of time, of which fragments have survived. But unfortunately, there are no existing complete copies of the 'Three Chapters'; due to it being written on paper, all copies may well have been lost or decomposed in the thousands of years since the Qin Dynasty ended. However, archaeologists have found many key examples of small seal script engravings. And to this day, small seal script remains a style of calligraphy practiced by artists in China and around the world. An example of a beautiful piece of small seal script. Next time we will look at how small seal script was replaced with the clerical script during the Han dynasty. Don't forget to check out our store for newly added proverbs and products!